Moran Market in the suburban city of Seongnam is an iconic venue illustrating the dramatic change in Koreans’ perceptions of dogs. In the past, dogs were viewed as a cheap, readily available source of protein. That sweeping perception has changed a lot over the past decade, particularly after the mid-2000s. Today, dogs are Koreans’ favorite pet and over 10 million dogs are living with Korean families. The shift in perceptions toward dogs has triggered the transformation of Moran Market from the notorious heartland of the dog meat trade to a clean market. There was cruelty and a foul smell in the air. There were never any children at the market, as parents never brought them there. That infamous image and the scathing past are showing signs of fading away. Moran Market has undergone massive refurbishment. According to the city government and the association of Moran Market vendors, there was one remaining butcher shop but it closed down in June. This has turned the market into a dog butcher-free place. One thing noticeable in the new market is the freshness of the air. The market is cleaner and more spacious than the old one, which was cluttered with dogs in cages. As you turn the corner from the subway exit toward Moran Market, dog meat butchers used to line the street that doubles as a pathway along the market. The butchers quickly spot unfamiliar faces in the crowd, and glare at them in a judgmental manner. It was required to follow the sidewalk full of dogs in cages piled on top of one another. Their faces were all scared, awaiting their cruel doom. But that negative feature was absent on the opening day of the new Moran Market, which bans any such trade on-site. “The horrible smells are all gone so I might bring my children now but the place is a little farther from the station,” said Park Jie-hye, 46, who’s been a regular customer of Moran Market’s other stores for five years since moving to Seongnam. Vendors showed mixed reactions to the changes. “It is way more convenient for us and customers,” said Kim Hee-ok, 61. She’s been selling fruit for 10 years in traditional markets. But other vendors were discontent and said they have had a hard time making ends meet after the market was relocated to its current spot as part of the renewal plan. Asked if they think their sluggish business was because of the disappearance of canine butcher shops, one vendor said it had little to do with her business. “We vendors are suffering because of the presence of large retailers in the neighborhood,” she said asking for anonymity. “We are suffering the consequences.” The relocation of the market was the result of the city government’s years-long endeavor to improve the reputation of the suburban city. In December 2017, after five months of evaluating and negotiating, the Seongnam government made a decision to end the canine butcher business in the market. The city authorities agreed with vendors to end the dog meat trade, promising financial support for the vendors who start selling products other than dog meat. Now most of the former dog butchers have switched to running other eateries or health food stores, according to the government official. “We want to set an example of a Korea that lives in harmony with domestic animals,” then-Mayor Lee Jae-myung said in a press conference last December, quoting Mahatma Gandhi. “The greatness of a nation and its moral progress can be judged by the way its animals are treated.” The new market is located in a parking lot site south of the street the marketers previously inhabited, next to a new public housing complex. It is 22,575 square meters, which is 13,757 square meters larger than the previous space. The new market has a multipurpose support center with one floor underground and two aboveground, which includes toilets, theaters, rest areas, floodlights and water and electric facilities the sellers can use. 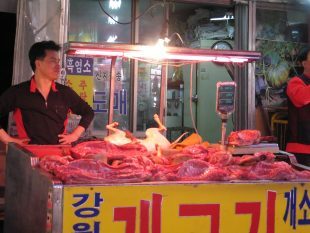 “The major difference is that the market does not have dog meat butchers anymore,” said Shim Jae-ho, a city official in charge of operating the market. “The market became a seller-friendly place, as it has convenient facilities that help them operate.” The refurbishment of Moran Market reflects the shift of Koreans’ perception toward dogs. An activist working with nonprofit group Animal Liberation Wave (ALW) said she and fellow activists used to protest the government to close down the market. “But we have no plans to protest regarding dog meat in Moran Market because it is free of canine butcher shops,” she said. The consumption of dog meat here has a long history. It originates from the Three Kingdoms period of the first century A.D. At that time, dog meat was a cheap source of protein and especially popular among people during hot weather. But in recent years, it has been controversial both within and out of the nation, due to animal cruelty and sanitary issues, with growing numbers of people viewing dogs as part of their family. Consumption of dog meat is not a usual practice these days, especially among the younger generation. According to a recent survey conducted by Last Chance for Animals (LCA) and ALW, the practice is declining sharply. Their poll revealed about 81.2 percent of South Koreans no longer consume dog meat, with 40.5 percent saying they have never tried it. Those who answered they have tried dog meat in the past but don’t eat it regularly stood at 24.8 percent. Also, many South Koreans have switched their dietary habits, as they prefer chicken instead of dog during hot weather. A 2015 Gallup Korea survey found 43 percent of South Koreans prefer eating samgyetang, or chicken ginseng soup, while only 6 percent eat bosintang, or dog meat soup.